Give natural deodorant a second chance with an armpit detox. Many of my friends are concerned about the aluminum and other toxic chemicals that are in regular antiperspirants and they want to use a natural deodorant. So they head to the store and buy the container of natural deodorant that smells good. They then try it and get frustrated that they still stink. My friends then go back to smearing toxic chemicals on their armpits as they don't want to be that stinky person in office/gym. I so understand the part about not wanting to stink but it frustrates me that my friend is trying so hard to get chemicals out of their body and then they use a product on their body that may cause breast cancer or worse Alzheimers. So I just wish that the companies that sell natural deodorant had instructions on their containers or at the website advising people to do an armpit detox first before they use natural deodorant for the first time. Most people have a hard time giving up antiperspirants as they don't want to be that person who stinks. What most people don't realize about antiperspirants is how they work. These toxic products have ingredients in them that block the sweat and all those years of sweat blocking with these harsh ingredients building up in your body. Your body sweats for a reason. So when you use a natural deodorant for the first time your body starts sweating all this smell junk out. Aluminum: It may be linked to breast cancer and Alzheimer’s disease. Parabens: An endocrine disruptor that may interfere with our hormone production. Phthalates: Another endocrine disruptor that may cause havoc in your body. Propylene Glycol: A neurotoxin may be linked to kidney and liver damage. The answer to the stinky sweat is a natural armpit detox! Most people have no clue about what an armpit detox is. I have heard about this paste that you make and spread on your armpits to draw out smelly toxins from your pits but I had never tried one, until now. I figured that I should try it before I talk about it. When I switched to natural deodorant almost two years ago, after learning about the dangers of antiperspirants at Shiftcon conference, I never did the detox thing. I did experience some stink but since I work from home and it was winter time, I did not sweat that much. So I guess I just naturally detoxed the stink out of my body. I know that many people work and don't want to stink so that is where an armpit detox comes into help with the stinky smell that needs to come out of the pits. Since I knew so little about armpit detoxing but I want to help my friends in their chemical elimination process, I reached out to bloggers who attended Shiftcon and are further along in their green journey. Carolina from https://mamainstincts.com/ shared with me her homemade Armpit Detox recipe. I love that this recipe uses 2 natural ingredients that I already have in my kitchen, bentonite clay and apple cider vinegar. 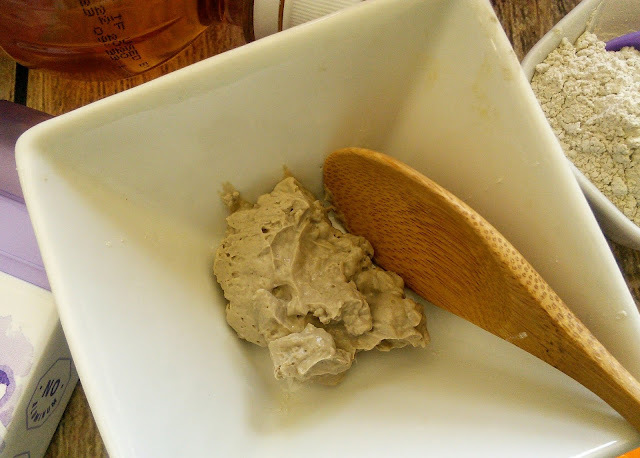 Many of you may not have bentonite clay in your pantry but I do as this is the main ingredient in my son's homemade natural SLS free Lemon Drop toothpaste and it has many other uses in other recipes like a face mask. This armpit detox is so simple to make and to use. 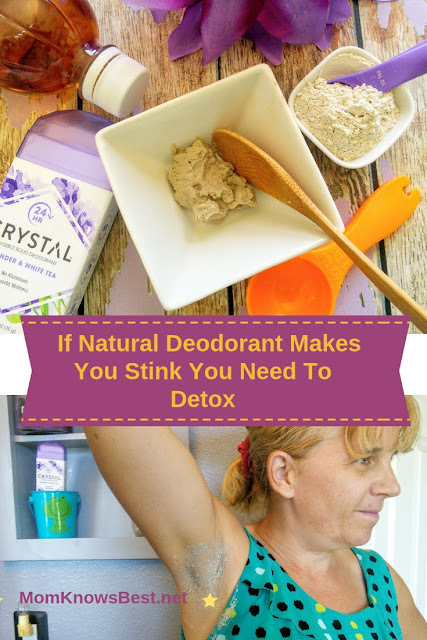 For the best transition to natural deodorant, I recommend starting this detox process and using a natural deodorant on a weekend when you are going to be home that way your body has two days to get the stink out. Everyone’s body is different so there isn’t a set number of times you should detox. Don’t want to buy the full-size ingredients? Get a DIY kit that comes with the exact amount of ingredients you will need to make this DIY product. 2. Mix it well. It should look like a paste. It if doesn’t look like a paste after you mix it well, you can add a tiny bit of water until you get the consistency of paste. 3. Once it’s ready, spread the paste on your armpits and leave it on for 5-15 minutes. If this is your first time doing a detox, Carolina from Mama instincts suggests you start with 5 minutes. Carolina also says the paste should not burn or hurt but if it does rinse it off right away. She has left hers on for 20 minutes at a time with no pain. 4. Once the time is up, you can wash it off with a cloth or in the shower. 5. As always when doing any type of detox, make sure you drink plenty of water to help your body detox faster. *The clay absorbs the metals (that’s how it draws out the toxins) and becomes less effective so if you use a metal spoon it will draw out the properties from the spoon. Carolina from Mama instincts says to repeat this detox until your armpits stop getting stinky. This detox is safe enough to do daily, but she prefers to do it 2-3 times a week. You should notice an improvement soon after your first application. Everyone’s body is different, this is why there isn’t a set number of times you should detox, but if you pay close attention you’ll notice these changes and you’ll know you won’t have to detox anymore. What is a good natural deodorant to use? Just like we ladies use different shampoos for our hair, we may like different natural deodorant. 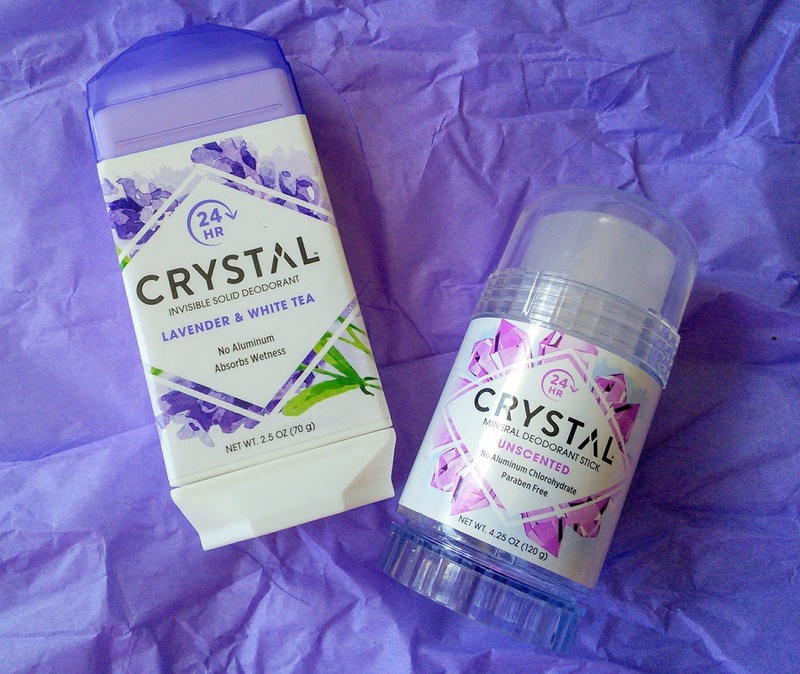 One of the brands that I like is Crystal Mineral Deodorant as they have many types of natural deodorant in many wonderful scents. My favorite is the Lavender & White Tea Invisible Solid while my son loves the Pomegranate Roll-On. Crystal also carries a Mineral Stick + Stone and a Spray form. They have four wonderful scents and also unscented. The natural scents are made from essential oils and extracts. I have tried all the scents in the Crystal Mineral Roll-ons and they all smell amazing. None of the scents bother my allergies either. The Crystal Mineral Stone took a while for me to get used to and it does work to keep me odor free. I keep the Crystal Stone in my shower and use it after my shower if I remember but I don't use it that much as I like scent in my armpits. 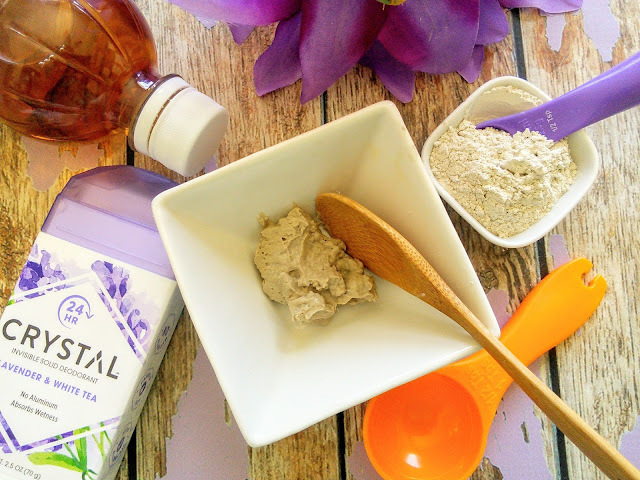 So the Lavender & White Tea Invisible Solid is my go-to natural deodorant. Will you give natural deodorant a second chance with an armpit detox? Most armpit detoxes are meant to make the transition from an aluminum-based antiperspirant to a natural deodorant easier. Many of the articles in favor of armpit detoxes claim that the natural deodorant will work better afterward. That's why home made ones are good. Oh wow, never thought of detoxing my armpits but it's great to know and I wouldn't mind trying it out sometime. Super interesting info. I didn't know about this. I appreciate you sharing this. Interesting. I admit, I've never tried natural deodorant. I'm not sure if it's for me or not, but I know people love their natural stuff. I never really thought of needing a detox for this reason. I have used some natural deodorants before, some I love and others not so much..
Good to know, I will prepare it. I have all the ingredients at home. I think I could definitely do with an armpit detox I think I am going to have to look into making one for myself! Thank you. The best way in keeping your underarm so attractive. I will definitely have to give this a try! I have better luck with natural deodorant than other brands, but this sounds right up my alley!!! I learned something new today, armpit detox, wow! I had no idea, but it looks pretty easy to do. And thank you for your recommendation of natural deodorant. I would have never thought to do a detox like this before trying natural deodorants! I need to cut chemical laden deodorants out and will definitely try this first before giving them a shot. My daughter uses natural everything, including deodorant. I don't know if she's heard of the detox. She's coming over tonight to bring me my grandbaby for the weekend, so I will ask her. Wow, this is such an interesting read! I have never thought of detoxing my armpit, which is actually a brilliant idea and not complicated at all. Thank you for sharing this! I had never heard of an armpit detox but it makes sense! Love that you also have a recipe for a home made detox! I never heard of armpit detox. I like natural products if possible I can use it. thanks for sharing with home made recipe of armpit detox. Wait, what?? I had never heard of armpit detox before, but it makes so much sense. I will definitely try this, because even my regular antiperspirant doesn't work on me sometimes. Thanks for sharing! I only use the deodorant when I was a teenager. The armpit detox is a new thing for me. Thank you for sharing it. Armpit detox sounds interesting! Have to try it. I hadn't though of this. My scent changed with my natural deodorant and I changed to another one. I'll give this a try. I haven't heard of an armpit detox before, but it does sound interesting. I'll have to look into it, thanks for sharing! I was told I needed to do this but I got confused and quit the deodorant instead. I'll have to try this! Looks like a useful product to be honest..didn't know something like this even existed!